When I was about 12 or 13 years old, I went to see the operetta/musical, Phantom of the Opera, for the first time. I loved it. I loved it even more the second time. The whole production was so special, so captivating, that the experience stayed with me all these years and I couldn’t wait to go again. 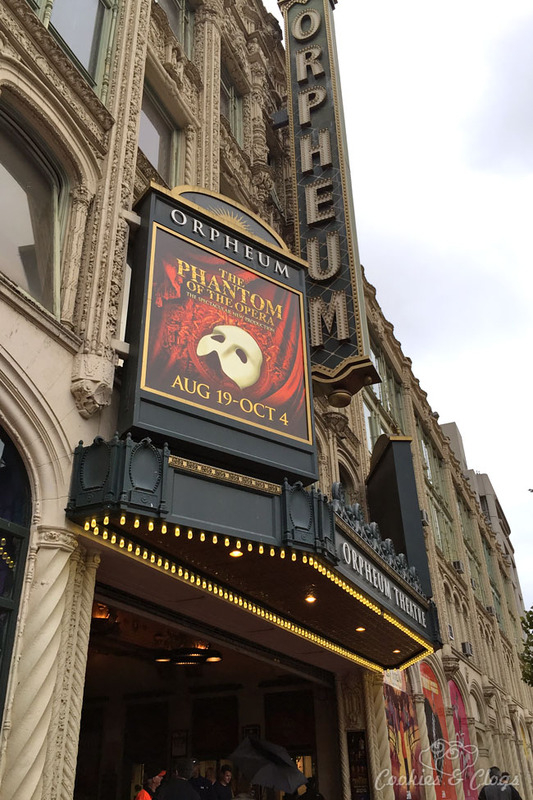 When I found out that Phantom of the Opera was on tour again and coming to the SHN Orpheum Theatre in San Francisco, I had to go see it with my family. I was especially excited for my daughter to attend since Phantom had such an impact on me when I was about her age. 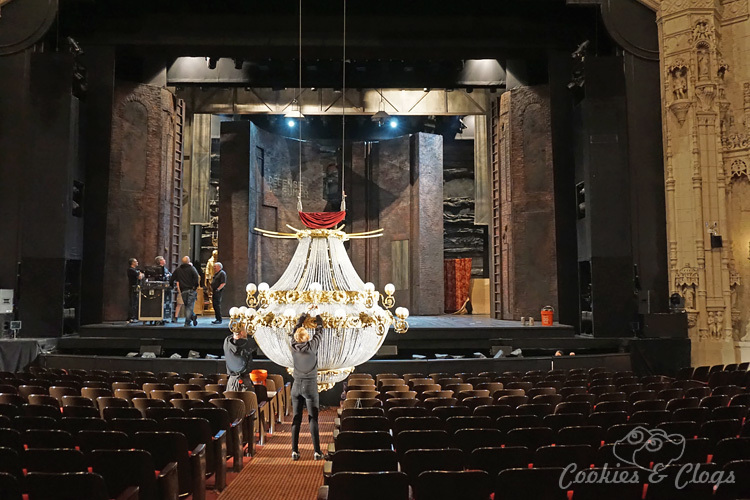 After a quick close-up look at the starring chandelier (part of a media pre-tour), I fetched my family and we took our seats. Phantom of the Opera is about a musically gifted, but disfigured, man who hides deep below the opera house. He mysteriously trains a young woman from the shadows and becomes enamored with her. She thinks Phantom is the “Angel of Music” her father promised to send when he died. Things turn sour when Phantom resorts to drastic measures to further the girl’s career and his rage boils as her affection turns toward another man. The story is delivered almost entirely in song (in English though). The touring Phantom of the Opera production is completely different from the original I saw 20+ years ago. 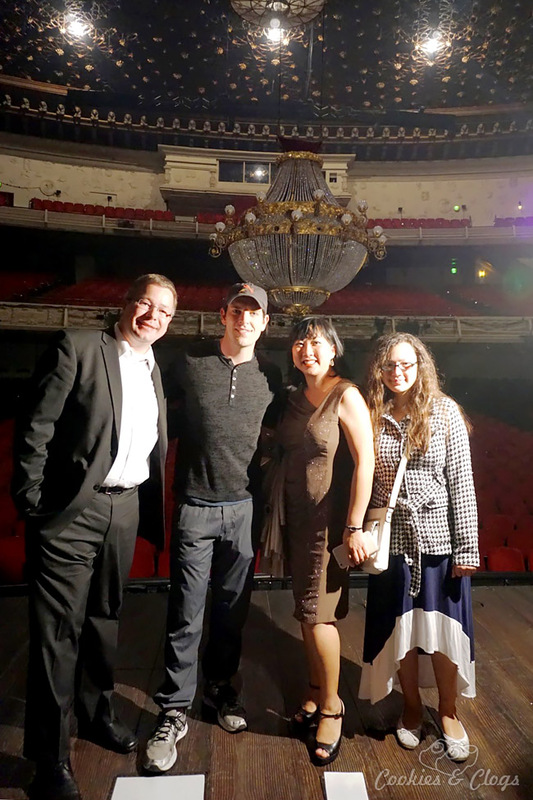 The cast specifically features younger talent in the lead roles, including Chris Mann as Phantom (who performed the night we attended) and actors were given more freedom to interpret their characters. As for the set and props, aside from the costumes, everything else is new. Even the music was altered to replace the sound of synthesizers so characteristic of the 80’s. This Phantom of the Opera is much darker than the previous version (which is currently still playing in London and on Broadway in New York). Phantom is no longer a pitiable romantic who had a hard life and who picked up some tricks of illusion along the way. No, this Phantom is disturbed, vengeful, and violent. He gets into fistfights and masterfully ties rope into nooses to graphically hang people (versus the dummy used in the original). He also throws around the woman he supposedly loves and tries to have his way with her on the bed when he’s angry. I was very concerned with the effect this would have on my daughter. I often caught her wincing during scenes that made her uncomfortable. According to her, Phantom was a murderous “psycho who she would want to get away from too.” There goes the third part of the love triangle and the touching tragedy where you root for him to find some measure of happiness. I guess 14 years old is too young for this version. Maybe she’ll like it better in 1-2 years. Singing was good but not mesmerizing. 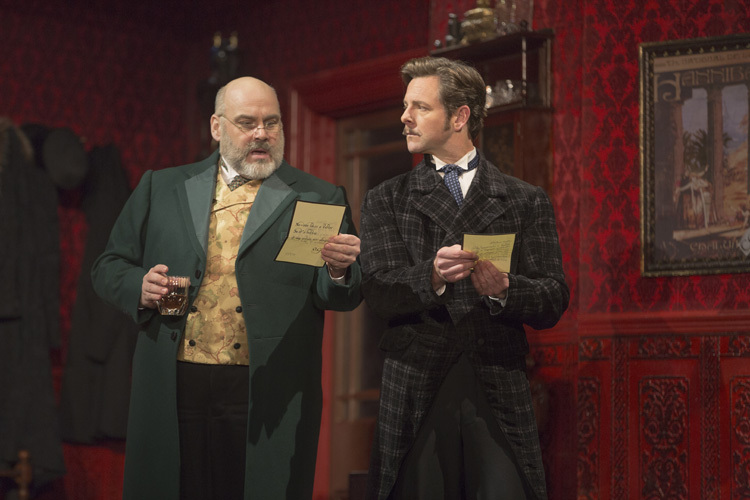 It was also very hard to understand what each person was saying/singing since most actors didn’t enunciate enough After each act, I had to explain to my husband and teen daughter what was happening. At least the orchestra nailed it and the voices of Carlotta (Jacquelynne Fontaine) and Christine (Celia Hottenstein for this performance) were beautiful. The new stage design and props are ideal for a touring show. The huge cylindrical set in the middle acted as an all-in-one set and scenes changed almost instantly as it turned, opened, and transformed. The office was richly decorated and folded out like a pop-up book. I was fine with the grand staircase being replaced since the hall of mirrors (from the novel) was gorgeous. As for the monkey music box – genius! The scale and grandeur of the sets have been toned down and are less whimsical. The props now support the story instead of shaping it. First time attendees will probably be attracted to the more realistic feel of each scene. 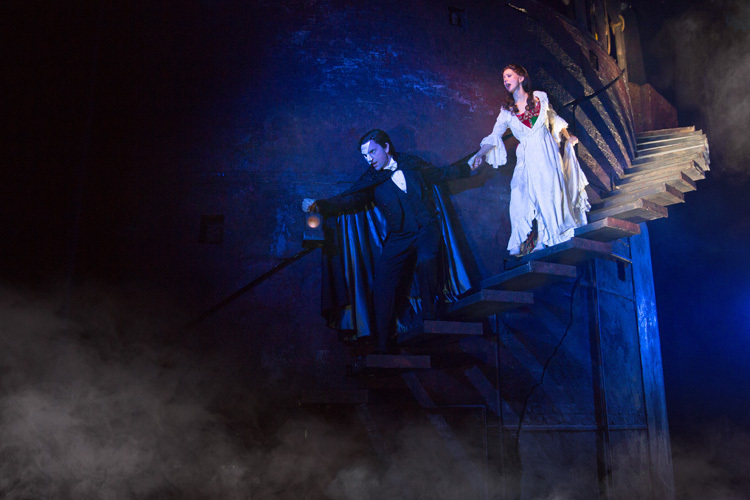 I personally miss the floating candelabras and that never-ending descent into the depths below though. To this day I clearly remember the original chandelier flickering with lights synched to the music. Excitement soared as an explosion of light burst through the cover, bringing you back in time, as the auctioneer announced, “Perhaps we can scare away the ghost of so many years ago with a little illumination. Gentleman!” The new chandelier, with its pyrotechnics, wasn’t as impressive. It came across as a random prop, not as the key element tying the story together as it was meant to be. I so much wanted my family to love Phantom of the Opera. However, this new production incited mixed reactions. My daughter found it creepy and depressing. Frans did enjoy the show but wasn’t wowed by it. He likened it to the local community plays we’ve watched before. For me, I had super high expectations but, instead of the grandiose operetta from my younger years, we got the travel-size edition. After a few days, I’ve realized that the show did ignite my excitement again so that’s definitely a plus. We all love the music though. Frans downloaded the original London soundtrack and we have been listening to it at home. Munchkin is also learning to play the songs on the piano. She thinks it’s awesome how dramatic the score is! The tour version is still enjoyable – it’s just different. The show is perfect for a night out in the city or to introduce millennials to the enchanting story. To fully enjoy the performance, it’s best to not have any pre-conceived ideas of the show and just experience it for what it is, a new spectacular reimagined for a new generation of fans. Have you seen Phantom of the Opera? Will you watch this new production? My family received complimentary tickets to attend the show. All opinions are my own.